It’s the Downtown Hermosa Beach Holiday Sidewalk Festival. All over town you’ll find Live Music, an Elf Scavenger Hunt, Carolers to get you in the holiday spirit, our fantastic Neighbors’ Shops and Restaurants, and more! Both of our shops will be offering 10% off all weekend, and you’ll get our pretty new Gum Tree canvas tote with every purchase! Saturday- Christoper the Elf is back, he’s so much fun, bring your kids down for some entertainment, they will love him. All weekend- We will have Arts & Crafts for the kiddos and treats too! Free hot cocoa for the kiddos all weekend, and the wishing tree is back on our patio for the 7th year in a row. This is probably my favorite holiday tradition. It’s been a pretty crazy couple of weeks here at Gum Tree. 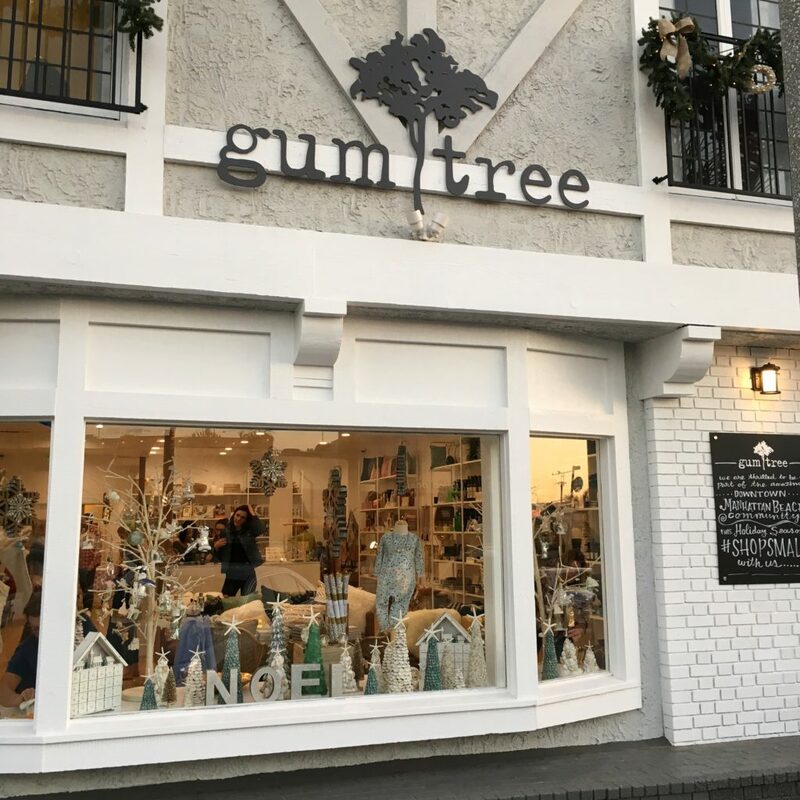 If you’ve been following along on Instagram or Facebook then you know we’ve added a new store to the Gum Tree Family, it’s at 324 Manhattan Beach Blvd, right downtown Manhattan Beach. We are super excited about our growing small business, and we could never do any of it without all of you, we are so grateful for our loyal customers and our amazing staff! I’ve heard from some of you that you’re concerned for our Hermosa stores, or you think we are closing Hermosa. That could not be further from the truth. We are not closing anything in Hermosa! It is our home and our heart, and we will always be there. Well, while we were there we learned a whole lot. You all know I have been a champion of Hermosa since we opened, and we’ve done our best to help to promote and grow the community down here, and I really thought we were finally past the people of surrounding areas not coming down to Hermosa. I thought we were past people thinking that it was all bars and no shopping or daytime activity…because we’re doing great and the downtown has really come so far, so many amazing small businesses down there and of course all of you have found us! 70% of people in the Manhattan Village Mall had NEVER HEARD OF US! And they lived predominately in Manhattan Beach or Palos Verdes. So, we knew right then that there was a huge untapped market right next door to us that we could grow into. We had plans to open another shop, we have a family to support after all, and these two cute kids to put through college. So we were looking at Playa Vista, Brentwood, Newport, downtown LA and many other places. And then we found out we could open within walking distance instead! So the hunt was on for a space downtown Manhattan Beach. It was a tough road, as downtown MB is going through changes of it’s own, with rents skyrocketing and chains moving in. It’s just the reality of the market. We knew we would only get a space if we could find a landlord who cared about small business. First of all, we had the best realtors ever! Catherine Wachtfogel and Patrick Sheekey of Coldwell Banker Commercial WESTMAC, you are our heroes! They believed in us, they understood the importance of getting the small business message across, and they made it happen, we would not have this space without them. To our new landlords, Tony and Ezra Choueke, thank you! You could have taken the easy way out and gone with any of the many chains that wanted the space, but you believed in us and gave us the chance and we are forever grateful. We promise to do our best to live up to our end of the bargain and make you proud. While I’m thanking people, my husband is a rock star. Best husband, father, business partner, cheerleader that anyone could ever ask for. Team Gum Tree, our staff, we could not have done any of this without you, you are the very best! Our contractor, Juan Carlos Balderas, you are amazing, on time, detail oriented, you never let us down, we love you! My new friend Shane Brown of Big Daddy’s Antiques, you helped me realize my vision for all of the shelving and the beautiful counter and it came out exactly as I’d hoped it would, you are amazing and I’m so glad I met you. Thank you! My friends who showed up to open boxes and do the dirty work, bring me lunch and dinner and coffee, thank you! And to my mom who picked up the kids, made them dinner, gave them baths, and kept them happy while I was away, there are not enough words. Big big thank you to all of you for your continued support. Thank you for coming on this journey with us, we would be nowhere without all of you. Hope to see everyone soon! 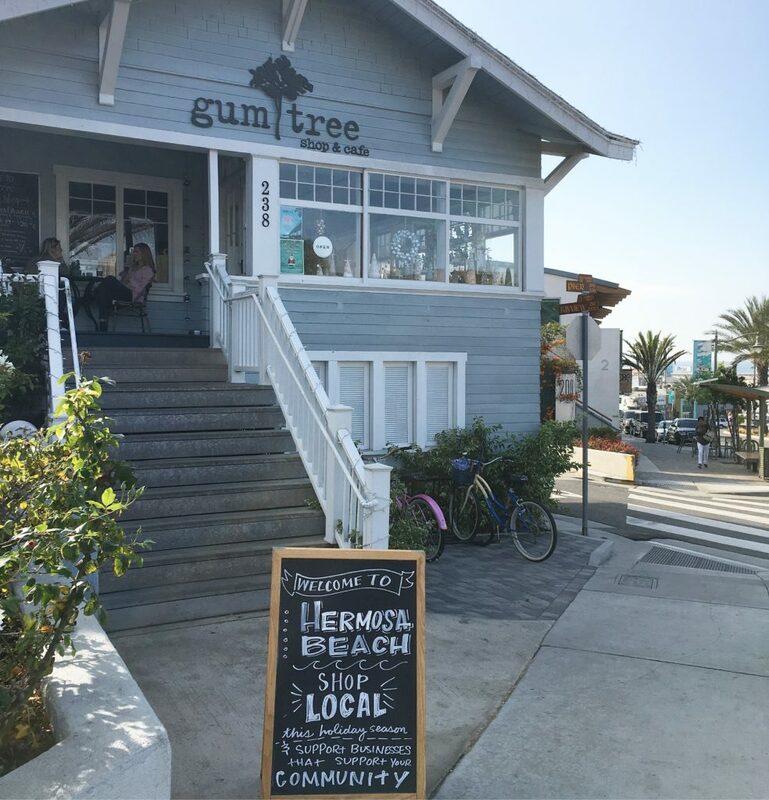 If you’re still worried about Hermosa, stop worrying and get down there to shop and eat and spread the word. It’s all good.